Our range of products include fire foam trolley. 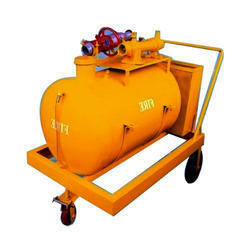 We are engaged in manufacturing and supplying of Fire Foam Trolly. This is a fire-fighting device used to extinguish fires in the residential and commercial premises. A fire retarding device is made of multiple components such as Hose, gate valve and mechanical pump. To ensure protection from the burning hazards, firemen wear hand gloves, helmet and fire proof cloth while using Foam Trolly at the specific locations. Our fire hydrants are appreciated for the properties like compact design, sturdy construction and user friendly functions. These systems apply strong water force on the fire locations through a pipe attached with its gate valve. Looking for Fire Foam Trolly ?